Tokyo, January 30, 2014 – Fuji Heavy Industries Ltd. (FHI), the maker of Subaru automobiles, today announced that the all-new "Legacy" (US specifications model) will make its world debut at the 2014 Chicago Auto Show (Press day: February 6 and 7; Open to the public from February 8 through 17, 2014). The Legacy, Subaru's flagship model which celebrates its 25th anniversary this year, will be unveiled at the press briefing scheduled for 10:30 AM CST on February 6 at Subaru booth. 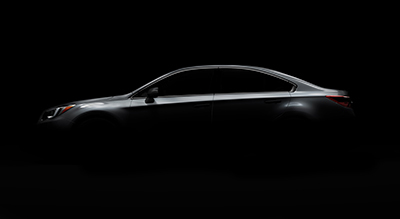 The all-new Legacy is a mid-size sports sedan which offers enhanced driveability and functionality while achieving a design required for a flagship model with a quality feel. Its styling fused with functionality such as roominess and visibility embodies the design direction proposed by the "Legacy Concepty" at the 2013 Los Angeles Auto Show. The site will feature information updates relating to the Chicago Auto Show including Subaru's press conference.